An ‘unhealthy’ tax regime: Is the Govt. stifling basic needs? This year’s global theme for World Health Day, which falls today, is universal health coverage (UCH) for all. In comparison to most countries in the region, Sri Lanka is in a positive trajectory towards this, with a policy goal to ensure universal health coverage to all citizens through a well-integrated, comprehensive health service. UHC is a health care system focused on medical service delivery – it predominantly revolves around accessibility, affordability, and availability of healthcare services. However, in the case of Sri Lanka, health needs to be looked at from a broader perspective. This World Health Day, while commending the country on a great public healthcare system and better access to water and sanitation than most other countries in the region, I’m going to explore the case of how some simple taxes on items that contribute to your health can lead to complicated concerns on your health. Are Sri Lanka’s tax policies depriving you of accessibility, affordability, and availability of proper healthcare, hygiene, and sanitation? Menstrual hygiene is not commonly discussed in Sri Lanka, having very little literature and understanding of proper menstrual hygiene management. 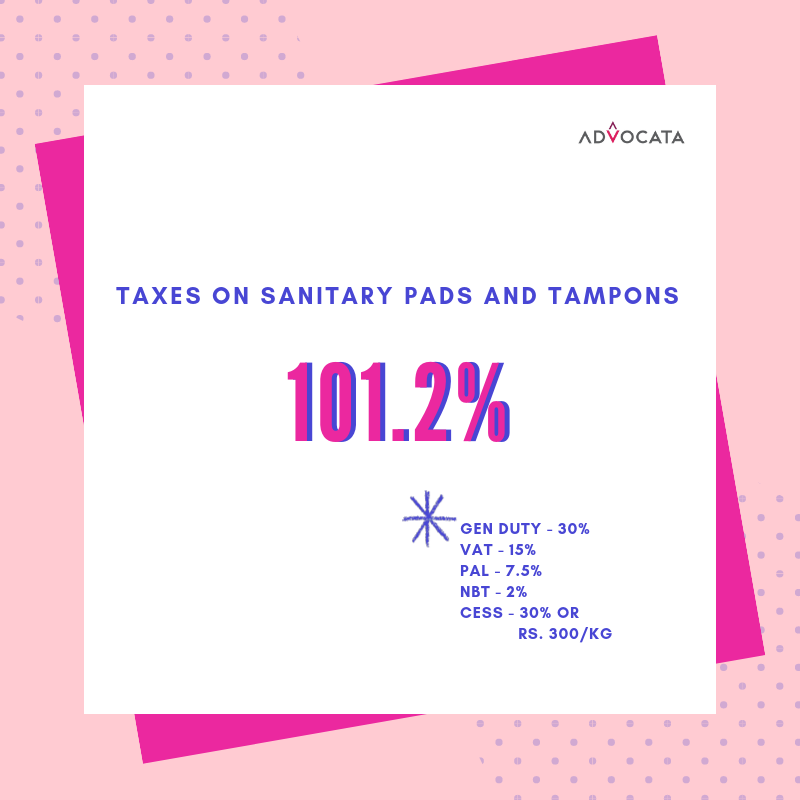 This is also probably a reason why a basic item required for proper menstrual hygiene – sanitary pads – have total taxes as high as 62.6% levied on them, despite being a country with 4.2 million menstruating women. More often than not, women are compelled to use unhealthy menstrual hygiene products or practices owing to their monetary conditions. Naturally, an intervention like taxes only worsens this situation. The most appalling of findings is that unhealthy menstrual practices can contribute to cervical cancer, one that unfortunately has proven to fall to the plight of many Sri Lankan women. Every year, 1,136 women are diagnosed with cervical cancer and 643 die from this disease in Sri Lanka (HPV Centre, 2018). Cervical cancer ranks as the second most frequent cancer amongst women in the country, wherein poor menstrual hygiene management is a direct causal factor of this. Of our population, 52% is women, out of which 4.2 menstruating women stand the risk of being diagnosed with cervical cancer due to poor menstrual hygiene. If we are taxing something as necessary as sanitary napkins that contribute to healthy menstrual practise, are we not then making health a privilege instead of a basic human right? In a recent interview, Senior Advisor at the Sri Lanka Water Partnership Kusum Athukorala stated that the main problem they have had to deal with when conducting sanitation programmes in rural schools is the lack of a proper disposal mechanism for sanitary pads. It is either this or the lack of proper toilet facilities. According to the WHO, although sanitation coverage in Sri Lanka is 92% – the best in the South Asian region – an area that they too have identified as one that requires further development is rural school sanitation. Period-friendly toilets matter. Additionally, although over 50% of our population have access to household sanitation facilities, diving deeper into the breakdown of these numbers is important. Despite great sanitation coverage, 7.2% of our urban population, 7.6% of our rural population, and 17% of our estate population still rely on a shared toilet facility for their sanitation needs, according to the Household Income and Expenditure Survey 2016. Why then do our rural schools lack proper toilets and why does a portion of our population rely on shared toilets for their sanitation needs? The answer lies in the prohibitively high cost of building toilets. Total import taxes on sanitary ware like commodes and squatting pans are over 60% and wall tiles, floor tiles, and finishing ceramic are taxed at over 100%. Out of our population, one million people live in temporary houses and 1.2 million people live in underserved settlements. Access to proper toilet and hygiene facilities are very limited in these types of households owing to the exorbitant cost of constructing one. Having access to sanitation is a basic human right, yet a portion of our population suffer on a daily basis from the lack of access to a clean and functioning toilet. Without toilets, untreated human waste can impact a whole community, affecting many aspects of daily life, and ultimately pose a serious risk to health. The issue runs deeper into societal impacts, such as teenage girls often leaving school at the onset of menstruation due to lack of privacy and the risk of contaminating infections due to unhygienic toilet facilities. This narrative needs to change. This World Health Day, while we commit our country to global goals that provision for more accessible and affordable healthcare facilities for all, let’s also look at health in a broader perspective. In Sri Lanka, universal health coverage can be realised through affordability, accessibility, and availability of better health, sanitation, and hygiene facilities – end taxes on periods and toilets! Anuki Premachandra is the Manager – Research Communications at the Advocata Institute. She has a background in public policy with an active involvement in policy communications. She is also an advocate for the reduction of the period tax and contributes to research and policy work in that subject area. If you have any questions or feedback on this article, she could be contacted on anuki@advocata.org or @anukipr on Twitter. Advocata is an independent policy think tank based in Colombo, Sri Lanka which conducts research, provide commentary, and hold events to promote sound policy ideas compatible with a free society in Sri Lanka. In a country with 4.2 million menstruating women, only 30% of them use sanitary napkins (SAARC Chamber Women Entrepreneurs Council). This statistic is appalling and the truth in this is saddening. As a nation where 52% of its population is women, the reality that sanitary napkins are only an option to a handful 30% is an injustice. A few weeks ago, we highlighted the absurdity of diaper taxes. The tax on diapers is so high that when calculated, for every three diapers bought, the Sri Lankan Government is ‘stealing’ at least one of them. The same applies for the case of sanitary pads and tampons where the government charges a colossal import tax of 101.2%. This 101.2% is on a woman’s basic need, but falls into the general pile of tax calculation without regard of its intrinsic value and purpose. Are we so focused on our protectionist values that we cannot decipher how unfair and discriminatory it is to tax a women on something that is beyond her control? A recent Roar article highlighted how most women cannot afford sanitary napkins and have to switch to using cloth rags instead. Cloth rags are both a sanitary and health concern. We are depriving women of what should be a basic right. The average price of a packet of 10 pads in Sri Lanka is Rs. 200. Imported pads are priced between Rs.200 – 250, and locally produced pads are also around Rs. 150 – 200. Protectionist taxes are meant to ensure that local production is boosted and that as consumers and women, we have diverse choice and a range of prices to choose from. However, the reality is that local producers actually have the comfort of enjoying a big profit margin per packet as the prices of the products in the market are high in itself, owing to taxes. A cost of a single pad is 24% more in Sri Lanka than it is in USA and 26% more than the retail price of a sanitary napkin in India. On the other hand, tampons are limitedly available, and when they are, the price of a tampon in Sri Lanka is 20% more than it is in the states? Aunt Flo’s visits usually are about 5 days long on average meaning that if 4 pads are used a day, a Sri Lankan women spends a total of Rs. 520 a month on something entirely beyond her control. This might not seem like a lot to most people reading this, but when you really look at it, for someone barely making minimum wage a day, this cost becomes a financial burden on them. If the average age of mensuration is between 13 – 45 years, this then means that a Sri Lankan woman spends at least Rs. 199,680 on sanitary napkins itself! It seems like the rest of the world is progressing fast with global movements against discrimination and injustice. It seems like it’s about time we caught up with #MeToo and #Timesup. We don’t think it’s acceptable that you have to spend close to 200,000 just because you’re a woman. Do you?